Are Female Old Masters an Untapped Market or a Marketing Ploy? Experts Are Divided, But Buyers Don’t Seem to Care. Rarely traded work by female artists helped Sotheby’s Masters Week generate $99.8 million, an eight-year high. Victoria Beckham with Artemisia Gentileschi’s Saint Sebastian Tended By Irene at the exhibition for “The Female Triumphant” at Sotheby’s New York. Photo courtesy of Tom Newton. It’s rare for an Old Master auction to receive coverage in Vogue and InStyle magazines. But this year’s Masters Week sales in New York, held in the freezing final days of January, generated more buzz than usual thanks to an unlikely celebrity endorsement from fashion diva Victoria Beckham, who promoted a selection of 21 works by 14 female artists. Did the stunt pay off? Might it help lure a younger crowd—particularly those interested in sifting through art history for overlooked talents—to the Old Master category? So far, it’s hard to say. The group of pictures—presented under the banner “the Female Triumphant”—realized $14.6 million, just overshooting pre-sale estimate of $8.9 million to $13.2 million. (Final prices include buyers’ premium; presale estimates do not.) All told, 17 of the 21 works found buyers across three sales. The Masters Week sales generated $99.8 million, the highest total for the series since 2011. 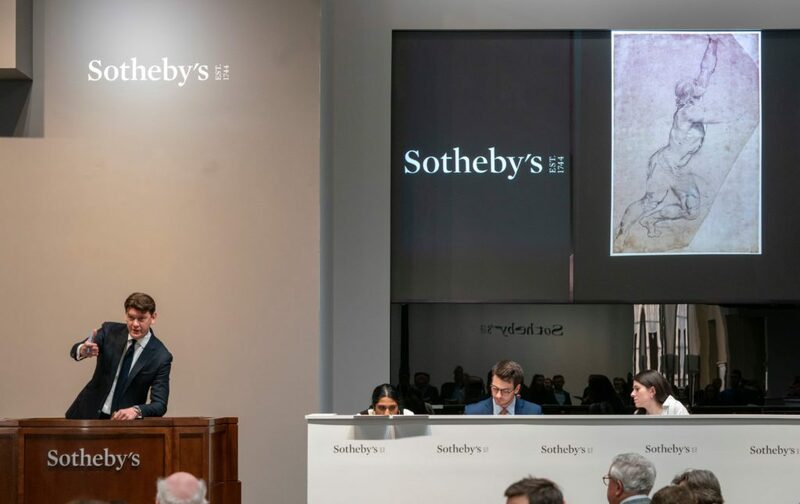 Sotheby’s attempt to cultivate the audience for female Old Masters comes at a time when both the market in general and museums across the globe are continuing to reassess the value of historic works by women. In 2017, the Uffizi Gallery in Florence made a concerted effort to show more female artists, while the National Gallery in London purchased a rare self-portrait of the 17th-century Italian artist Artemisia Gentileschi last year. This fall, the Prado—which organized its first exhibition devoted to a female artist just two years ago—will present a show dedicated to two pioneering 16th-century artists, Sofonisba Anguissola and Lavinia Fontana. Victoria Beckham at the exhibition for “The Female Triumphant” at Sotheby’s New York. Photo courtesy of Tom Newton. At Sotheby’s last week, the big winner was Élisabeth Louise Vigée-Le Brun, a storied French female artist active from the mid-18th to early 19th centuries. Her Portrait of Muhammad Dervish Khan (1788) fetched a record $7.2 million at Sotheby’s master paintings evening sale on January 30 (above its pre-sale high estimate of $6 million). The painting was included in the Paris Salon of 1789 as well as the Le Brun retrospective at the Grand Palais in 2015. The monumental portrait of an Indian ambassador to France smashed the artist’s previous $1.5 million high mark, set at Christie’s in October 2017, for Portrait of the Artist, Bust Length (1794). It also set a new record for any work of art by a female artist from before the Modern era, edging out a 1710 still-life by Rachel Ruysch, which fetched $2.5 million at Sotheby’s in 2013. 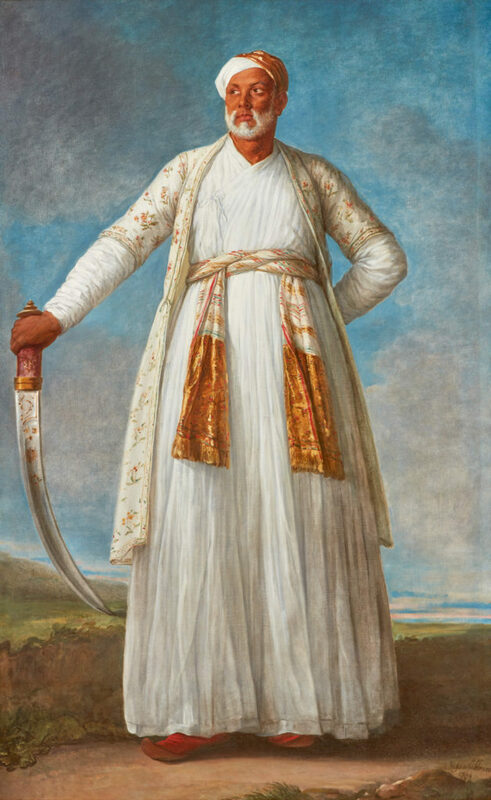 Elisabeth-Louise Vigée Le Brun, Portrait of Muhammad Dervish Khan, Full-Length, Holding His Sword in a Landscape.Courtesy of Sotheby’s New York. 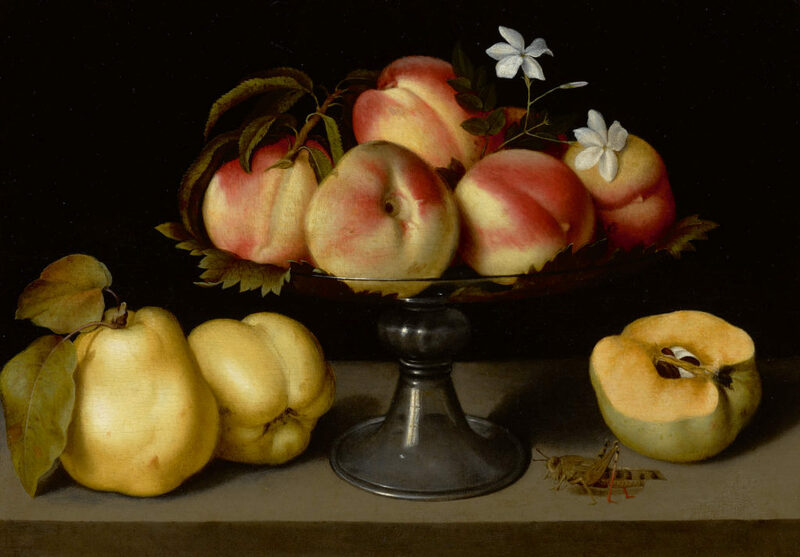 Only one other work by a female artist appeared in the top 10 lots sold at Sotheby’s master paintings sale: Fede Galizia’s stunning oil on panel, A glass compote with peaches, jasmine flowers, quinces and a grasshopper (1607). The work, which was backed by a third party and last sold for $1.64 million in 2006, set a new record for the artist at $2.4 million. Nevertheless, the Le Brun represented a big chunk (56.5 percent) of the premium-inclusive $12.7 million realized for the group of 11 works by female artists in the January 30 sale, just grazing past the pre-sale high estimate of $12 million. Sofonisba Anguissola, Portrait of a girl from a noble family, bust length (ca. 1532–1626). Courtesy of Christie’s. All told, seven records for female artists were set across three sales, including Virginie Demont-Breton’s maternal tour-de-force, Femme de pecheur vernant de baigner ses enfants (1881), featured in the 19th century European art sale on February 1. It soared to $543,000, more than triple its high estimate. The last time it sold was at Sotheby’s New York in 2001, where it went for $126,750. The results from last week’s sales illustrate just how thin the market for work by female Old Masters has been at auction up to now. Sotheby’s pointed out that last year, it sold only 14 works by female Old Masters, compared to 1,100 works by male artists in the category. The scarcity was also evident across town at Christie’s Old Master and British drawings sale on January 31, where just one of 120 lots was by a female artist. (Christie’s no longer stages Old Master painting sales in January, so direct comparables are not available.) 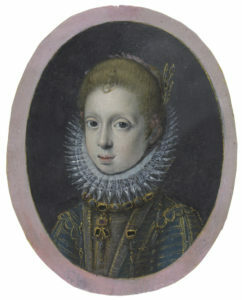 A petite oval-shaped 16th-century watercolor, Portrait of a girl from a noble family, by King Philip II’s court painter Sofonisba Anguissola, brought $16,250 (pre-sale estimate: $15,000–20,000). Fede Galizia’s Glass Compote with Peaches, Jasmine Flowers, Quinces, and Grasshoppe. Courtesy Sotheby’s. There are a number of reasons female Old Masters are so poorly represented. As Sotheby’s specialist Calvine Harvey noted in the catalogue, female artists from the 17th to 19th centuries faced huge hurdles. The jury is still out whether Sotheby’s elaborate marketing effort for the “Female Triumphant”—which included a cozy dinner at the Frick Collection for the museum’s young patrons and Sotheby’s clientele ahead of the same—will kick-start a trend or draw the millenials to the field. “I think Sotheby’s did a really good job making it trendy for a category that needs a little bit of that injection of making it more current today,” said Fotini Xydas, a senior vice president and art advisor at Citi Private Bank who nabbed a second Le Brun at the evening sale, Portrait of Mrs. Spencer Perceval, nee Jane Wilson, bust length (1804), for $237,500. This entry was posted in Auctions and tagged Artemisia Gentileschi, Bob Haboldt, Calvine Harvey, Élisabeth Louise Vigée-Le Brun, Fede Galizia, female Old Masters, Fotini Xydas, Jenny Saville, Lavinia Fontan, Muhammad Dervish Khan, Old Master paintings, Rachel Ruysch, Sofonisba Anguissola, Sotheby's Masters Week, Sotheby’s, Virginie Demont-Breton, Yayoi Kusama. Bookmark the permalink.